In the last year, I’ve become intrigued by the ubiquitous and iconic sunset image in travel media depicting Hawai‘i. You may know the scene—a centered sun hovering over the ocean, a silhouetted palm tree in the foreground, blazing skies heavily saturated in orange, red, and purple. Browse any ABC shop and you’ll find this picture repeated on postcards, calendars, and mugs. 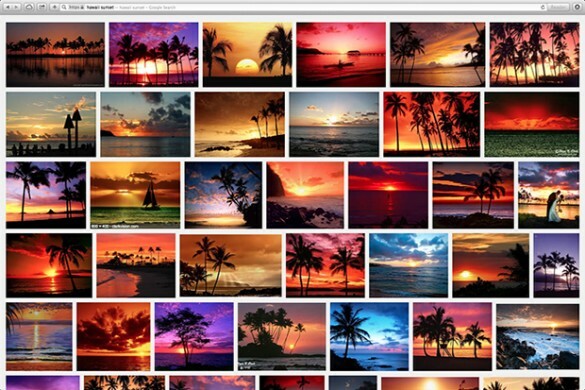 A simple image search on your computer yields similar results – see above. In fact, these are the types of sunset images we expect, are drawn to, and may even create ourselves when we point our cameras out towards the setting Hawaiian sun. Yet, what lies beneath the surface beauty of a picturesque sunset postcard? What happens when the natural experiences of paradise become interrupted by built environments that mimic nature? This is especially interesting in relation to Hawai‘i’s mythology as a pristine and unspoiled landscape. In Oil Tanker Sunsets, I present oil barges as both stereotypical sunset postcards and abstract explosions of light disrupting the ocean horizon. My work explores variations of this artificial sunset in an effort to examine the facilitation and survival of “paradise.” In order to support the islands’ population, oil must be shipped in monthly for consumption. When we look beyond the mirage of these sunsets, we uncover the technology needed to maintain life on an island and explore the complex boundaries between the built and natural world and the tenuous relationship between expectation and reality. All landscapes are constructed. Garden, forest, city, and wilderness are shaped by rivers and rain, plants and animals, human hands and minds. They are phenomena of nature and products of culture. There is always a tension in landscape between the reality and autonomy of the nonhuman and its cultural construction, between the human impulse to wonder at the wild and the compulsion to use, manage, and control. Landscapes of city and wilderness represent poles of continuum in the history and intensity of human intervention. A wonderful project and discussion of the work! Beautifully written and a fresh perspective for me.